Storefront Software and Portal Applications That Are Second to None! It's no longer an option for companies to provide their product and services over the Internet--it's a necessity! The KommerceServer eCommerce Suite is mobile ready and contains robust eCommerce web Storefront and web Portal solutions that are designed to be integrated with your enterprise application. It also includes an advanced framework for building and maintaining eCommerce applications. New! KommerceServer Release 5.6 is now available, contact Kore to see a demonstration. 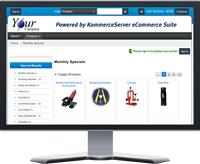 The KommerceServer eCommerce Suite is mobile ready and contains the webStoreFront, webPortal, and webAdminstration modules. It contains significant out-of-the-box functionality for business-to-business (B2B) and business-to-consumer (B2C) eCommerce environments. The software is configurable and can be customized if needed, plus you can tailor the look and feel to meet your needs. Replace your website with a new integrated, modern website and start selling today! 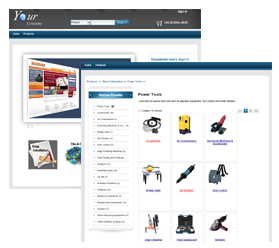 Integrated B2B and B2C eCommerce Storefront solution and online product catalog that is flexible, feature-rich, and cost-effective. 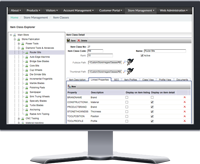 Supports complex business channels and advanced pricing strategies. Easily customized with the integrated content management system (CMS). Enterprise information and customer portal that provides customers self-service access to their information 24/7. Includes: orders, RMAs, invoices, shipment tracking and customer accounts. You can also use the webPortal internally to look-up information and place orders on behalf of your customer. Complete on-line website configuration, content management and administration capabilities. Manage roles, users, menus, and security. Monitor site usage and activity. The eCommerce Suite is mobile ready out-of-the-box and includes the full power of the webStoreFront and webPortal in a more compact mobile solution. The responsive web design of KommerceServer provides a streamlined interface that automatically adapts to each mobile user's device. A perfect complement to your corporate website. 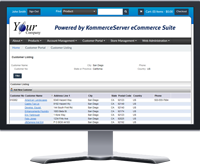 KommerceServer is designed for integration with a back office system. This integration provides key information for the webStoreFront and webPortal such as: customers, parts, inventory, prices, orders, invoices, shipments, etc. KommerceServer uses Kore's Kourier Integrator as middleware to enable integration with other back office systems. A key feature of Kourier Integrator is the ability to update the KommerceServer Microsoft SQL Server database in near real-time with only the most recent changes from the back office system. This makes it fast and easy to keep the systems synchronized and boosts overall performance. 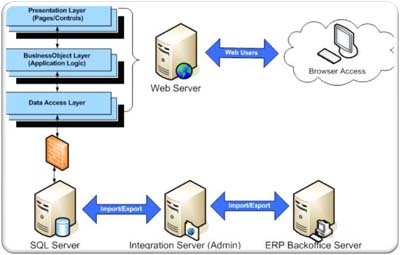 KommerceServer includes an extensive framework for building enterprise Web applications. It includes dynamic role-based security model and an object-oriented 3-tier architecture. KommerceServer is built on a Microsoft SQL Server database using Microsoft MVC.NET and ASP.NET, which provides the KommerceServer architecture with increased security, improved performance, higher scalability and unmatched flexibility. The KommerceServer architecture includes the advanced features required for an integrated enterprise eCommerce and eBusiness solution.